This order includes a DNA Collection Kit (cotton swabs and test tubes), a DNA “Match” certificate, and a DNA “Mis-Match” certificate. To execute this joke, collect DNA samples with the cotton swabs as directed by the kit instructions, then pretend to mail the test tube samples to the laboratory (but you can secretly throw all that stuff away). After 7 or more days have passed, pretend you received the DNA results from the lab. This is the NEW STYLE TEST, upon ordering select if you want your test results to show a match or not a match. CAUTION: By completing and submitting any form and or checkout process on our website, you agree not to use this product for purposes which may be illegal, immoral, fraudulent or hurtful to others. Like almost any item in existence, this product may be used for fun or for evil, depending solely on the intentions of the user. It is designed as a novelty/gag device. Be sure your "mark" has a sense of humor before unleashing this product upon them!.Practical jokes of any kind can be hurtful to someones emotions. KNOW YOUR VICTIM. Be sure your "mark" has an "evolved" sense of humor. All Products Sold or Distributed by Entertainment Imports LLC, FakeABaby.com, ARE NOT REAL! They are Fake Gag Products. We do not produce or reproduce any or real documents or products. Medical or otherwise. All products are our originals works of Art made for the sole purpose of entertainment. They are OBVIOUSLY FAKE! 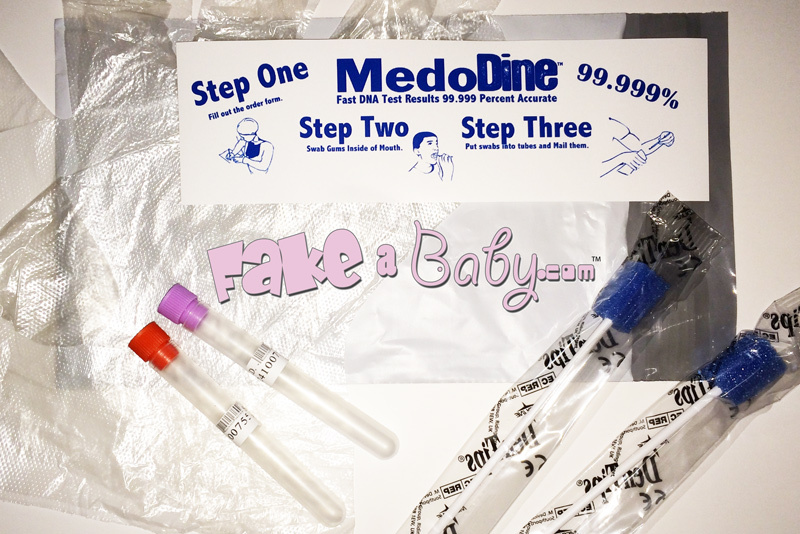 All of our products, including but not limited to our Fake Personalized Ultrasounds, Fake Personalized Sonograms, and Fake Personalized Pregnancy Papers are intended for Gag and Joke purposes only. We do not sell products with real doctors names or use signatures of any kind. received it and its frickin hilarious! received the fake dna test it and its frickin hilarious! Fabulous it would fool anyone. I think fakeababy.com does a excellent job. even my daughter was fooled by it. Awsume.Great Ladies..Make him tell on him self!